When it comes to the places we live in, there is a puzzling paradox a lot of people usually face; we want the most spacious houses, yet we would hate if we were surrounded by too much empty space. We prefer our homes to be vast, but we want them cozy nevertheless. Such a predicament often emerges when we cannot think of good spare room ideas for that empty space we have. 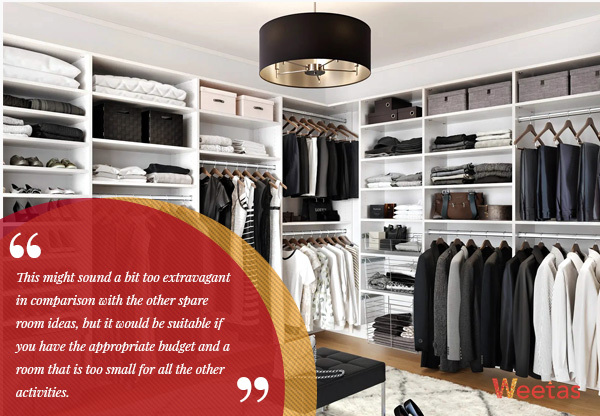 And having an idle spare room is not only a waste of some useful space in your home, but they also become a collector of dust and insects easily. That being said, there is always one or more spare room ideas that fit both your budget and your personal preferences. If you are a bookworm like myself, then this must be included in your spare room ideas’ list. A home library is relatively the cheapest idea to utilize an empty space; this makes it worthy of being your first choice to consider. Again, this would only be a good idea if you are – or one of your family members is – an avid reader and you have an ever-growing stockpile of novels and books which you struggle to find space for. Needless to say, you are free to customize the space according to your needs, preferences, and budget. 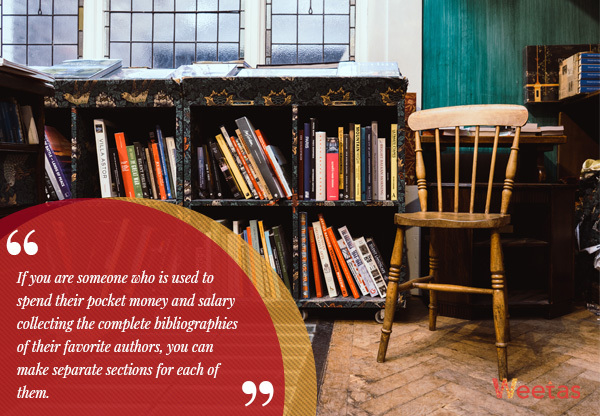 If you are someone who is used to spend their pocket money or salary collecting the complete bibliographies of their favorite authors, you can make separate sections for each of them. You might want to go with the genre-based classification or just the simple alphabetical order as well. On the other hand, if your career obliges you to always read the latest textbooks written in the field, you can add a small study area equipped with the stationary you would need in the corner of the room. 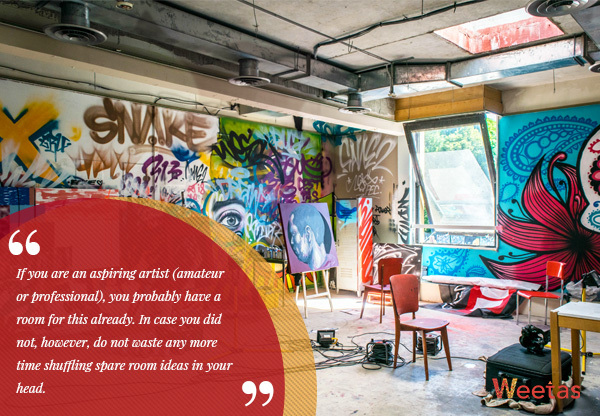 If you are an aspiring artist (amateur or professional), you probably have a room for this already. In case you do not, however, do not waste any more time shuffling spare room ideas in your head. Set up the room to be your personal small studio; start by getting a small desk for yourself in there that is fully equipped with the tools you need. After that, start adding all the complimentary touches around you on the walls: your previous artworks, artworks that help to stimulate your imagination, a small shelf for field-related books, etc. 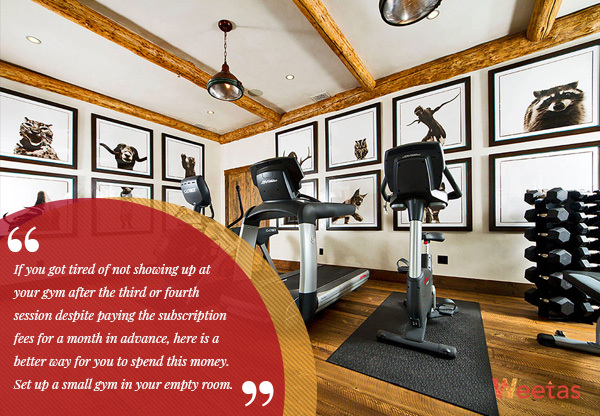 If you got tired of not showing up at your gym after the third or fourth session despite paying the subscription fees for a month in advance, here is a better way for you to spend this money. Set up a small gym in your empty room. Start with the cardio must-haves: a treadmill and a stationary bicycle; next, purchase a few dumbbells of different weights; last but not least, if you still have some extra money and space left, get yourself a fancy weight-lifting machine. If you are a dedicated cinephile with a flexible budget in hand, no need to keep that room empty anymore. 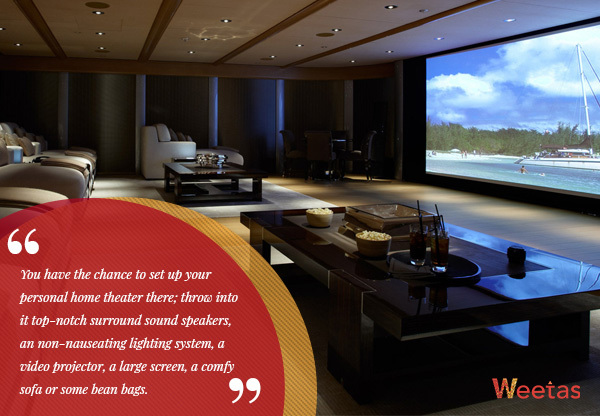 You have the chance to set up your personal home theater there; throw into it top-notch surround sound speakers, a non-nauseating lighting system, a video projector, a comfy sofa or some bean bags, and – why not? – a small popcorn machine. There you have it: your own little cozy home cinema. This is one of the most recurring spare room ideas. 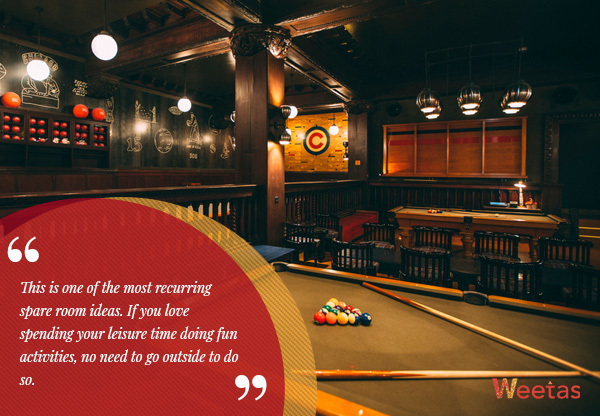 If you love spending your leisure time doing fun activities, no need to go outside to do so. With a small ping pong table, a good LCD screen, a pair of comfy bean bags and, of course, your favorite video game console, you can get a basic-yet-entertaining fun area within your house. This is probably not the most fun spare room idea you can execute. 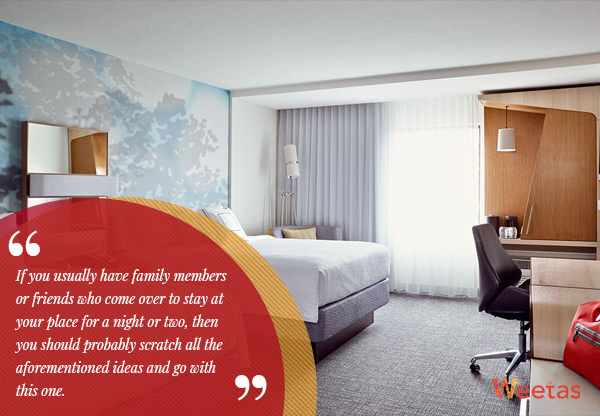 However, if you usually have family members or friends who come over to stay at your place for a night or two, then you should probably scratch all the aforementioned ideas and go with this one. There are no special preparations that you should do here more than what you would do to set up a normal bedroom. Just try to go with gender-neutral colors and decors so that they would fit whoever would need to stay over for the night. For more details, read our blog on turning a room into a guest room. Tired of stepping on your kid’s toys and action figures when you arrive home after a long day at work? Here’s one of the spare room ideas that can help spare you that. 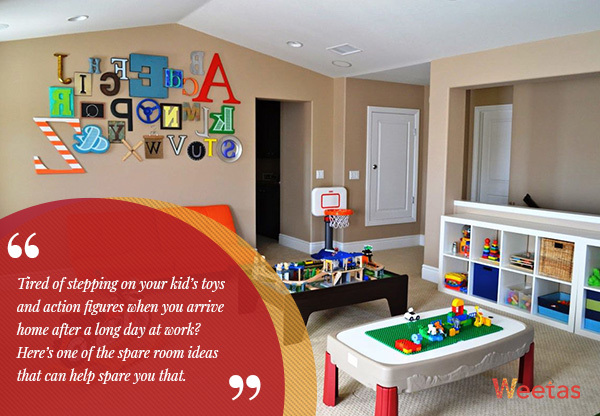 From small toy sets to kids’ tent houses, you can set up the room to be your kids’ little haven; of course, this depends on the room’s space, the budget you are willing to allocate for the matter and your kids’ preferences. This might be an idea that is too obvious especially if you are someone who works from home. 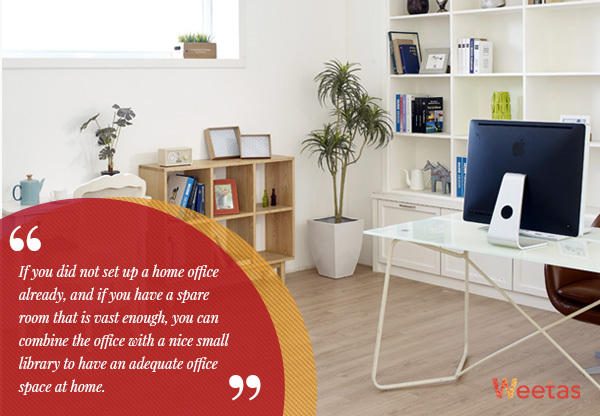 However, if you did not set up a home office already, and if you have a spare room that is vast enough, you can combine the office with a nice small library to have adequate office space at home. This might sound a bit too extravagant in comparison with the other spare room ideas, but it would be suitable if you have the appropriate budget and a room that is too small for all the other activities; you can install your own walk-in closet with all the items you might need in it (mirrors, shoe lockers, etc). 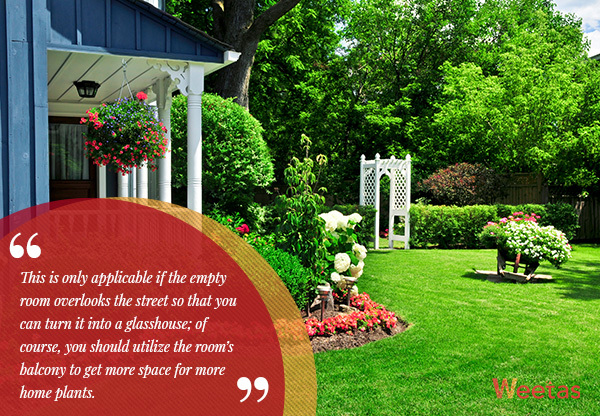 This is only applicable if the empty room overlooks the street so that you can turn it into a glasshouse; of course, you should utilize the room’s balcony to get more space for more home plants. We suggest you read our following blog to learn tips and advises on how to take care of your small home garden especially during summer time. Also, this other article will help you learn more about the way you can utilize home plants to decorate your home. Those are just a few of several spare room ideas that you can execute to utilize an enclosed space in your house. In the end, any idea which can help make your home comfier is a good idea.